Nearly Free Stuff: It's Mega Swagbucks Day!!! I love Friday’s for obvious reasons but also because that means it’s Mega Swagbucks Day!! Friday they hand out even more point simply for searching! 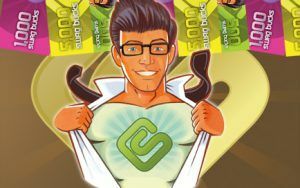 Swagbucks is a search engine that rewards you with Swagbucks periodically when you search. These Swagbucks will add up and then you can redeem them for awesome prizes and gift cards. We have been getting the Amazon gift cards and using them for our Diapers, Christmas, and Birthday Gifts and it help cut our out of pocket expenses!